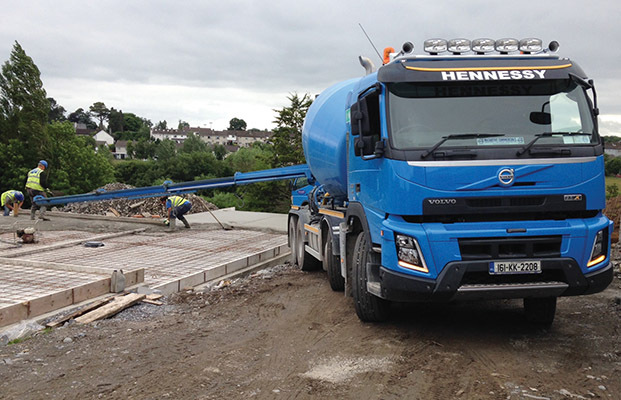 P Hennessy & Co Ltd has few equals when it comes to the supply of ready mixed cement, sand & gravel, aggregates and road-making materials in the greater Kilkenny area. Established in 1978, the company continues to go from strength to strength and recently took delivery of a brand new Volvo Readymix concrete truck from McCarthy Commercials Ltd.
A household name in the South-East for almost 40 years, P Hennessy & Co Ltd operates from a large gravel-based quarry in the townland of Sheastown, which is one mile from Bennettsbridge and four miles from Kilkenny city. From here, managing director Paddy Hennessy and his team produce and deliver Readymix and aggregates throughout the region, supplying predominantly to builders, farmers, local authorities and civil engineering firms. The company has always strived to produce a quality product and to continually improve its production standards. Quality is the company’s number one priority on all products which are regularly tested and CE Certified. As well as running a fleet of six trucks, P Hennessy & Co Ltd operates loading shovels, excavators, crusher and screening plant and a state-of-the-art washer at its busy quarry in the heart of Co. Kilkenny. The Hennessy fleet is divided equally between Volvo and Hino. The new Volvo FMX 420 8x4 automatic supplied by McCarthy Commercials in Kilkenny is one of five concrete bottles, with a single tipper completing the line-up. Despite the nature of the work, the trucks are always immaculately turned out and never fail to catch the eye with their distinctive all-blue livery. “The new Volvo truck reflects our commitment to investing in the latest machinery and plant,” sales manager Brendan Murphy explains. P Hennessy & Co Ltd provides a prompt Readymix delivery service. Its impressive fleet ensures it can respond and deliver the required volume of Readymix regardless of the quantity required. In addition to Readymix, the company supplies a wide variety of crushed stone, gravel and aggregate types to hundreds of farmers and builders in the area for drainage, filling, road-making and construction purposes. Crushed stone grades are categorised by the size of the stone after it has been crushed. The size of the stone determines what application it will be best used for. P Hennessy & Co Ltd has the capacity to produce several grades of crushed stone, including 4” down, 3” down, 2” down (Clause 804), 2” clean and dust. The ever-popular Clause 804, which can be either produced from graded crushed rock or standard graded stone, is used as a blinding or finished surface on top of a base material. “We like to think that we supply the best stone in Kilkenny. We have a growing customer-base and won’t be beaten on quality, service or price,” Brendan continues. “From our quarry, we extract stone for a wide range of uses. Washed graded stone, for example, is used mainly for percolation areas, drainage and soak holes. Most of our customers are in the farming, construction and industrial sectors. P Hennessy & Co Ltd is fully committed to implementing the provisions of the Safety Health & Welfare at Work Act 2005 and any other relevant legislation which may arise in the future. 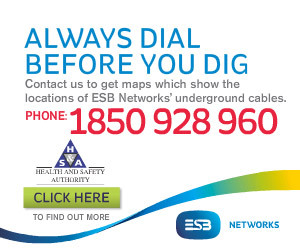 Its policy is to ensure the safety, health and welfare of its employees in so far as reasonably practicable and to ensure local residents are not exposed to risks to their safety and health.